Do-It-Yourself : 18% Grey Card | ShutterTux - Photography, Linux & Life! If you’re serious about exposure & colour balance in your photographs, you must use an “18% Grey Card”. Though today Auto White Balance has come a long way & gives pretty great results most of the time, it does gets fooled at times under tricky mixed lighting situations. Here the grey card will come at your rescue. It will also prevent a lot of your time during post-processing & save you the hassle of correcting WB & exposure. In first part of this article, I’ll teach you how to make a 18% Grey Card for yourself. I highly recommend to make this DIY 18% Grey Card to understand(practise) about exposure & colour correction. This DIY 18% Grey Card isn’t technically perfect but will still give you close to accurate results in your photographs. Once you get a hang of exposure & colour corrections in depth, consider purchasing the commercially available Kodak 18% Grey Card for accurate results. 1) Image Editing Software supporting Layers. I recommend GIMP, its great & free too. 1) Open GIMP. Hit File>New. 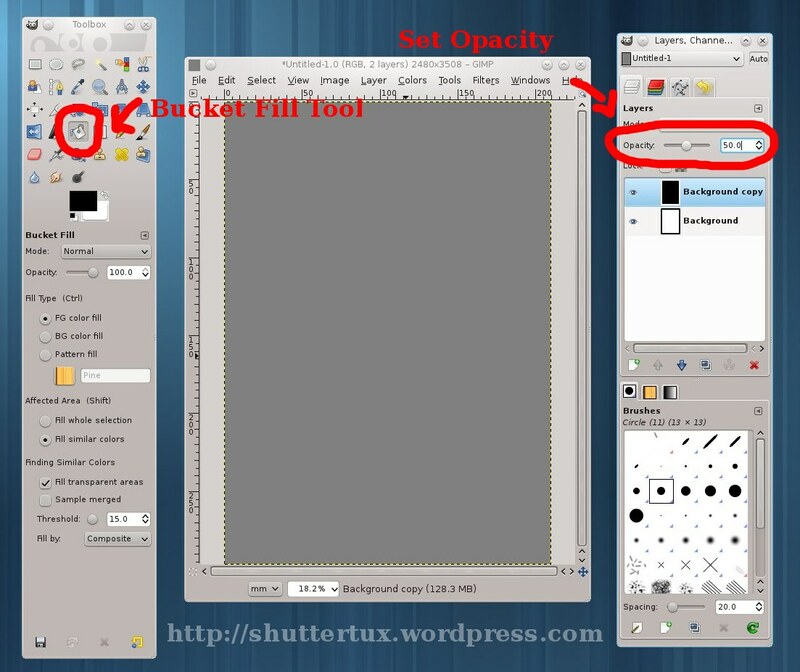 In the new file creation dialog box, select A4(300ppi) & click OK.
2) Now go to Layer menu & select ‘Duplicate Layer‘. 3) Now press ‘Shift + B’ to select ‘Bucket Fill Tool’. Ensure that ‘Black’ colour is selected as foreground colour. Now click the cursor on the duplicated layer & the layer should be filled with black colour. Now from the GIMP toolbar adjust its opacity to 50%. Save the file as tiff. 4) Now just take a printout of this file on an A4 paper sheet. After that, cut the printed A4 sheet into four equal pieces & stick the pieces over the white card-board. Ensure you cut the card-board pieces slightly bigger than the grey card pieces so you can hand-hold them without ruining the grey area. There you’ve it. Your 18% Grey Card is ready to use. Keep these four pieces in a ziplock bag & into your camera bag. In the next article, I’ll teach you how to use these grey cards. You are right Gaurave, I am also use grey card for white balance, Auto white balance is not perfect all time. manual white balance is excellent for correct color result. It was very useful. Thanks. Thanks for the tutorial, it is perfect for us using the Gimp! Keep up the good work, cheers. hello, nice tutorial, but why are you using 50% opacity to get grey and not using 18% grey? i mean 18% red, blue green and filling a layer. Can be done that way too. The 50% opacity method gives me good results. This is not really how to do it. Just because you choose 18% gray in your software doesn’t mean the printer will produce an 18% gray when it prints. You need to experiment a little, make some prints that are darker than what your software says is 18% gray and some that are lighter. Then you need to to see which one in practice reflects the same amount of light as a factory made 18% gray card. The gray cards you buy ready made aren’t just the right shade of gray they also have the correct reflectance, so that they reflect the same amount of light not matter what the angle of incidence is to the source of light. If you want to check which of your printed sheets is the closest to a genuine 18% gray card then you need to borrow an 18% gray card and match the expoure on that. Failing that you can take an exposure reading from your camera on a scene that has a good range of dark and light objects and a single light source (everything in the shade, or everything in the sun or everything outside under an overcast sky). Get the correct exposure for that scene, then try out your various gray card contenders to see which one gives the same exposure for the general scene. You will end up with the right shade of gray but you won’t be able to control the reflectance of the surface and it might give you an incorrect reading under small intense light sources like the sun. But for most situation it will be fine. Keep a record of what settings in the software print out the right grey on that particular printer. My advice is to print out 5 correct sheets as soon as you have worked out the correct settings just in case the printer is not consistent over time. If all this is too much trouble then why use a technical piece of kit like a gray card in the first place! Setting Custom White Balance in Canon EOS DSLR’s « ShutterTux – Photography, Linux & Life!